I have been buying our cats the same canned cat food for a few years now, Earthborne Hollistic’s Chicken Catcciatori, but I have been wishy washy about choosing a good dry food. Lately I settled on the Earthborne Hollistic’s brand but a few weeks ago the store was out of it so I bought another brand that happened to be on sale during the month of January. 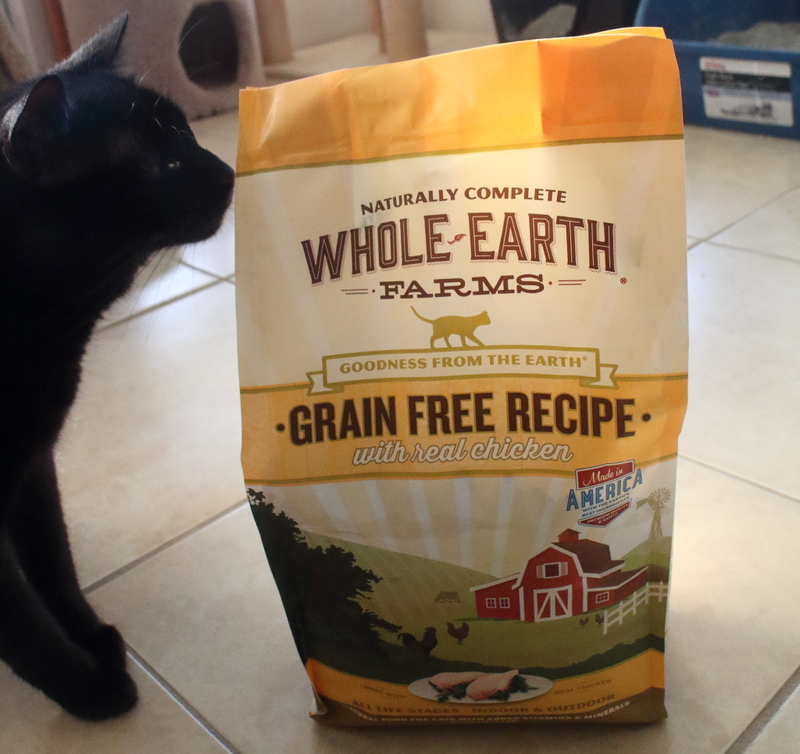 What I bought is called Whole Earth Farms Grain Free Recipe with Real Chicken. I soon discovered there is a major problem with this food. The cats like it way too much. In a similar situation many years ago, our cat Tigger almost died because I bought a new food that was too good. He ate so much food so fast that a clump of it had become stuck in his esophagus and he was having trouble breathing (see story here). We had to find an emergency vet open at night. The difference between then and now is that the food I bought back then was a much lower quality. It should be noted here that I was not paid nor did I get free or discounted food for talking about this product (although I am an Amazon affiliate). 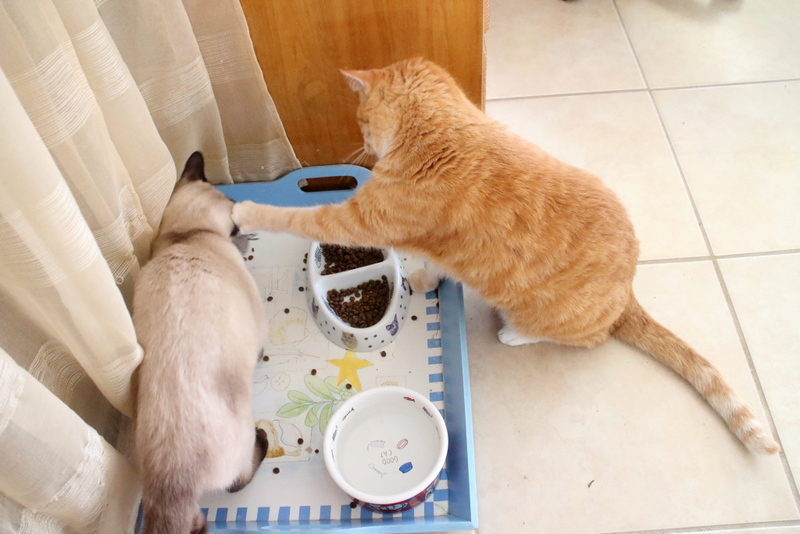 I don’t worry so much about another vet visit but I do worry the cats will get fat(er) eating so much food. I did buy a second bag hoping that they would get used to it and like it less, but that hasn’t happened yet and the bag is almost gone. Since I already let their food bowls remain empty for parts of the day, I think I can get around the problem buy not giving them more food They will just have to deal with having empty bowls for longer parts of the day. Another possible solution is to try a different flavor that they might not like as much. I could also go back to the last food I gave them. What do you think? 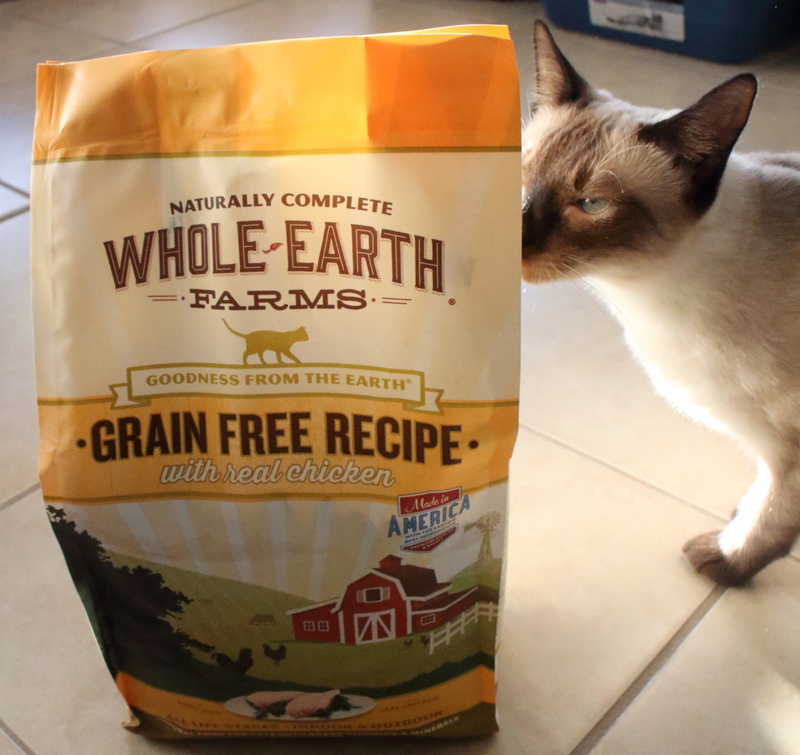 This entry was posted in Uncategorized and tagged Cat food, Cats, dry, Earthborne Hollistic, grain-free, Whole Earth Farms on February 12, 2017 by Charles Huss. We are so strictly portion controlled here! We only get canned food and no dry. Any food left sitting around would be immediately hoovered up by Boodie, who needs it the least! So we get breakfast and dinner (sometimes Binga gets lunch because she’s older and needs the extra calories). Once that’s gone we have to wait until the next meal. I want to do just dry but I need to get Chris to eat the wet food first. You could get an automatic cat feeder that releases from every so many hours so it will last longer 🙂 I may try this food on my cats. We don’t get dry foods anymore, but we do eat the Whole Earth Farms canned food. In fact, we just had it for dinner! Wow. Do you like it? Amazon is a great site; however, chewy.com offers that food for a much more reasonable price than amazon!!! That’s good to know. I buy it locally but Amazon is good for reference because they have everything.